There are eleven Rudras (force-fields) that manifest at different points of time, in the four-dimensional expanded spacetime (post cosmic inflation epoch), which is called the 'Brahma'. The following seven are exactly as in the standard model. Apart from these, the following two are definitely talked about in Standard Model, but not as force-fields. I map them as two force-fields that do definitely exist. A force-field that shortens the Fifth dimension (Brahma’s Head that is cut -off by Rudra) which in my view could be the source of Quantum Entanglement. Such a fifth dimension was proposed by Einstien too. Note that Gravity is not a force-field in all of the above. It is only a space-time warping manifestation. Brahma the expanded spacetime post cosmic inflation epoch, getting impacted by force-fields is felt as ‘Gravity’. Hence Brahma is also Gravity. In this Brahma manifests the Rudras. But Brahma (Gravity) is not a Rudra (force-field) at all. 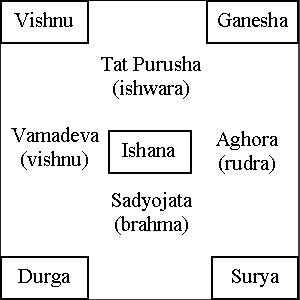 Of these the five rudras that are color coded are the Pancha Brahma Rudras. The Pancha-Brahma mantras are in Taittiriya Aranyaka (X.17-21) of the Krsna Yajurveda. The tenth chapter is called the Mahanarayan Upanishad. Therefore, these mantras can also be said to belong to the Mahanarayana Upanishad. The five rudras are Sadyojata (Electromagentic, Yellow in color), Vamadeva (Strong Force, Cyan in color), Aghora (Weak force, Magenta in color), Tatpurusa (Electro-weak force, Red in color) and Isana (Electro-weak-strong force, Colorless). These five rudras or force-fields do the five functions in the Universe. In the last blog, I wrote about SadyojAta, iSAna and Tatpurusa from the pancha brahma mantras and pancha brahma upanishad. Let’s see about Aghora and vAmadeva in this post. Aghora is Nilalohita, the red-blue or purple or magenta, the Weak force. The Weak force decays all particles of Dirac-Fermi field. It destroys all the matter that is present in the Universe. It is the destroyer. Ghora is intense, very much, very fierce, terrible, frightening (due to the intensity or being fierce) etc. Since Ghora is intense, dense, it is something that has a shape. Aghora is opposite of intense or being fierce. Aghora rudra is the force-fields that decays, destroys whatever is intense/dense, decays it into its components. Aghora is the Ocean’s (salilam) reddish (gauri) moon (candram) known (veda) to have two inside (divti-akam). Aghoram has the two inside. One is reddish (gauri) moon (candram). Another is the dense (sAndram) water filled (nIr dAbham) blue ocean and is said to be the (udAhrtam) dakSina-agni, the southern fire that destroys everything. Agni is 'interaction' or 'tranfser of energy'. Hence it is mapped to fire. Aghora simply is the blue-red destroying/decaying interaction, which is the Weak force. Combination of fifty components; destroying all impure (sarva aghaugha vinasanam) states (sthithi) of (anvitam) desired creations (iccha kriya) while preserving (rakSana) the momentum (and energy, zakti samyuktam). Weak force destroys the states of matter (desired creations) while preserving the momentum/energy. It is a combination of fifty components. Unto the aghora (destroys the intense), then (atha) unto the ghora (intense), unto the aghora-ghora (destroyer of the intense) and beyond, unto the destroying arrow of everything (sarvatha sharva), salutations to the one who is in the form of rudra/force-field. Vibrating again and again, very much, with intensity after intensity that crosses into forms that cover again and again, in expressions after expressions bounded by the strong force, the astras of Aghora destroys them again and again. The astras of Aghora, the weak force field, destroys the expressions that are bounded by the strong force, which vibrating again and again with intensity cross into various forms that cover. In short, whatever vAma produces Aghora destroys or decays them. VAma deva is strong force. Vama means that ejects, vomits. vAma is that came from that emission. The strong force vomits/ejects the quarks when it has energy. vAma deva rudra is the strong force field that which emits/ejects. vAma is left. In writing convention we start with left. Hence what comes first is placed in left. In the Unified Electro-weak-strong force, the first force to separate is Strong force. Hence it is the left-most of the force. Hence vAma is also left. The strong force-field (vAmadeva) is the Eldest of the Strong-electroweak force-field to be born. Strong force field separates out first and hence jyestha. It is the best (sreshta) of the force-fields that is the cause of most ‘mass’ of the Universe, as most mass in Universe comes from nucleus of atoms, which is caused by strong force-field. All matter are made of atoms. All atoms have nucleus. Nucleus has baryons. All baryons are quarks subdued/tamed by strong force-field. Hence all matter (sarva bhuta) are tamed/subdued (damana) by the strong force-field. Baryons are bound by ‘Residual strong force’ which is mediated by ‘virtual’ (manas) pions. The exciter (unmana) of this ‘manas’ (virtual) is the residual strong force. vAmadeva Rudra is strong force-field. When strong force-field interacts with quarks of dirac-fermi field it become strong interaction. This is visualized as drinking ‘Soma’. Thus Soma is strong interaction. vAmadeva, Shambu et al denote Strong force field. Soma denotes Strong interaction. Both are essentially same except that strong interaction indicates that strong force-field interacting with other fields. (Soma being drunk). Soma is Agni. Agni is 'interaction'. Soma is Strong interaction. Soma Rudra is strong force-field. The strong interaction (Soma) is mediated by gluons. The gluons not only mediate the strong interaction (like photons mediate the electromagnetic field), but also take part in the interaction. This interaction happens in this way. Standard model postulates ‘eight’ gluons (though nine combinations are possible with 3 colors only eight gluons exist). These eight gluons are the ones that are mediating strong force. Three quarks of three different colors (Red, Blue, Green) combine and form a color neutral combination. This is a baryon. This baryon can be a proton or neutron dependent of the type of the quark. The two baryons proton and neutron combine and form the nucleus. This is captured in the Pancha-brahma upansihad’s description of vAmadeva Rudra. The strong force-field surpasses over all the ‘dusta’, binding the agitating quarks into baryons, causing all the wealth of universe. It communicates great knowledge of purified nature. Strong force binds the agitating quarks into baryons, and then binds baryons into nucleus. The baryons (valence quarks) are surrounded by a lot of ‘dusta’, the sea-quarks, which are called ‘vrtra’. The strong force is able to surpass all of them and creates wealth of matter for the universe. It communicates a great knowledge for us. That if we surpass the surrounding difficulties or dustas, we will create wealth. Equal joining of the ‘learning world’ (the world of quarks that learn the strong force); equals the splendor of crores of nucleus (bhanu); fully endowed (samanvitam) with variety (nAna) of the ‘eight-parted’ (astaka). Strong force are mediated by gluons. There are three color charges of gluons and eight types of gluons. The world quarks learn the strong force through these eight different types of gluons forming crores of nucleus. The subservient (adhinam) ca (and) steady (dhira) vibration (svaram) brings up (avahaniya) the best (anuttamam). The wisdom (jnana) of digesting (samhAra) by joining together (samyuktam), fully endows (samanvitam) with two (dvaya) powerful beings (zakti). The steady strong force vibrations brings up the best possible. The wisdom of digesting, by joining together, endows with two powerful ones. The protons and neutrons are the two powerful ones that come up in the core of nucleus due to the steady strong force -field. They are formed by digesting, by joining together of quarks. White colored, blended with tamas (opposite of sattva, rajas), in itself is the complete awakener. Restrained in the three abodes, fully endowed with such three abodes restrained ones. The two powerful ones (proton and neutron) are formed when strong force-field gets restrained in three abodes (three quarks). Such three abodes matter (protons and neutrons) fill up the nucleus. The two powerful ones (proton and neutron) are white colored or do not possess any color (neutral charged). (Strong force-field/vAmadeva) gives (dam) all wealth (sarva saubhAgya) of real particles (nRnam) (which are) (as a) result of all its actions (sarva karma phala pradam); Eight indivisible aksaras join together; eight leaves are situated internally. aksaras are basic unit of oscillations, syllables. Here the basic 'syllable' or 'unit of oscillation' for strong force are the eight gluons that mediate the strong-force-field. The wealth of real particles available in the Universe is given by vAmadeva rudra or strong force-field as a result of its actions (on other fields). Eight indivisible aksaras, eight leaves situated internally mediate the joining of these particles. Thus vAmadeva in Pancha Brahma Upanishad explains the strong force field. Let's discuss the directions of these rudras in the next post..